Falmouth's coastguard station will only operate in daylight hours as a Maritime and Coastguard Agency (MCA) sub-centre, the government has announced. It is part of moves to reduce 18 stations across the UK to eight, with only three staying open for 24 hours. Cutting the number of control centres was intended to modernise the service and save money, the government said. If operations are reduced at Falmouth, its 27 staff could be reduced to just 10, the BBC has been told. The British service will have just three major maritime operations centres: Aberdeen, Dover and Solent. Falmouth would be one of five so-called "sub-centres" open only during daylight hours, along with Humber and Swansea. A decision on the location of two other sub-centres was being made as part of a 14-week consultation, the government said. 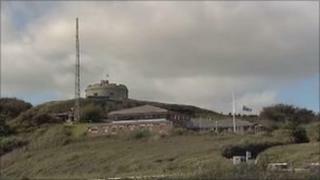 The Marine Rescue Co-ordination Centre, at Pendennis Point in Falmouth, has been open since 1981. It monitors an area totalling 660,000 square miles of the Atlantic Ocean. The daytime-only move has raised concerns that local knowledge would be lost. One member of staff at Falmouth, who did not want to be identified, said the skills built up at the rescue centre were vital and could not be easily transferred elsewhere. He said: "The skills that the crews at Falmouth have accrued over the past 30 years - dealing with satellite communications and long-range search and rescue - are not the sort of skills that can be taught in a classroom. "This is one of our concerns, that the role that we fulfil currently will not be done any more." However, the Conservative MP for Truro and Falmouth, Sarah Newton, said the moves were part of a "long overdue reform of the service". She said: "The current structure of it has been going for 40 years. We have to respond to these changes." Two other South West England coastguard stations - Brixham in Devon, which looks after the south east Cornwall coast, and Portland in Dorset - are facing closure under the modernisation programme. Any cuts to stations must not put lives at risk and staff must not be forced out of the service, the Public and Commercial Services (PCS) union said.